I heard this story on the news and immediately was touched. For once, a news story made me emotional in a good way! A local girl (living about 15 minutes from where I grew up) was on a trip to study marine biology with her college. She found herself stranded in the middle of the ocean after an early morning snorkeling trip. She survived being stranded for 16 hours. When I saw this on the news, I was blown away by her determination to get through it. 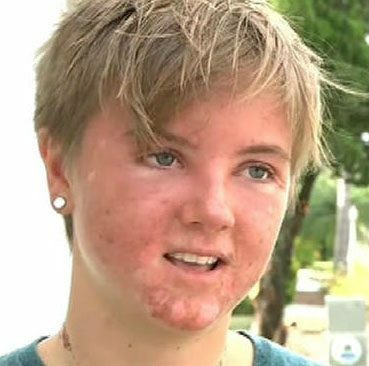 She was dehydrated, sun-burnt, stung by jellyfish and stranded in the middle of the ocean. What a terrible situation to be in. Yet, she did her best to stay positive. Because of her positive attitude and determination, she survived. Can you imagine what other things we can do if we simply believe we can? Even for the most experienced swimmer, it’s a nightmare scenario. Stranded in the middle of the ocean with no food and the blistering sun burning down on your face. Jelly fish and sting rays circling beneath your feet. That’s what Heather Barnes had to deal with on Friday…for 16 hours. The 20-year-old Deptford, N.J. native was visiting the islands of Cayos Cochinos on the northern shores of Honduras with other students from the New College of Florida. Barnes, an aspiring marine biologist, had been there for three weeks, snorkeling and studying. Friday marked her last day on the island. Barnes went out into the ocean around 4 a.m. That’s when her trouble began. The tide then began to pull her farther and farther away from land. It wasn’t long until Barnes realized the perilous situation she was in. She was lost in the middle of the ocean. Things only got worse as the sun came out and burned her exposed face. While she had on swim fins and a wetsuit, that didn’t prevent her from feeling the painful stings of jelly fish. AiA Classic – The AiA Classic (formerly known as Adventures in Attitudes) is a learning system for professionals at all levels of an organization. The AiA Classic has been redesigned to match the original program created by Bob Conklin, however it’s updated with exercises and projects relevant to today’s workforce. AiA Classic promotes healthy attitudes and skills in listening, patience and communication.